Enjoy hours of pretend driving fun with the Big City Garage. This fantastic multi-story garage is packed full of fun and realistic features including a car lift to raise your cars to the top floor. Cars can go up in the car lift, through the car wash then up and down the ramps before finding a place to park. The top story of the garage includes a helipad with real working lights to guide the helicopter down safely You can fill up your car with "petrol" from one of the pumps or if it is dirty run it through the car wash which features authentic sounds. The garage features ramps to chase your cars down-why not race against your friends or your Dad to see who is the best driver? 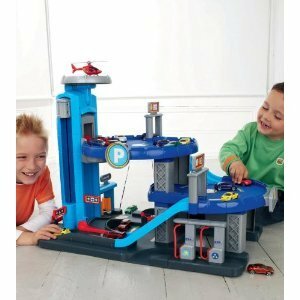 With moveable barriers, lots of parking space for all your vehicles, lights and realistic whizzing and screeching brake sounds the Big City Garage is every young car fan's dream. Requires 3 x AA batteries (not included). Contents include: 1 x garage, 1 x set of stickers, 1 x helicopter. Cars are not included. Works with standard cars like Hot Wheels and Matchbox (sold separately).